I know many who deem self exploration a “touchy feely” waste of time. As I alluded previously, I used to think that as well. Quit overindulging. Control your emotions and just get on with it already! Might putting some science behind it give credibility to the importance of knowing oneself? What I’m talking about isn’t simply a matter of being able to say, “Well, that’s just the way I am.” Too many of us stop there, short of getting to the crux of what can really transform us, our relationships and our results. It is knowing how “the way I am” can limit me. Knowing how “how I am” impacts my relationships with my family, success in life and/or business. It’s knowing how I operate in the world affects my ability for joy, compassion and even love. At a recent conference, I attended a “Future Masters” training led by those in our company who have reached the highest achievement. Anyone wanting to learn the magic road map to profit in our business would have come away sorely disappointed. The resounding message from leader after leader, again and again, was that it isn’t about what we are DOING. It is about who we are BEING. Uh oh. You mean I might be the problem? Over dinner at that same conference, a group of us discussed what deters people from self exploration. The common denominator for each reason was the same: Fear. Fear of what one might discover. (What if there’s something wrong with me?) Fear of having to take responsibility. (What if I have to give up complaining about my boss/mother/father/son/sister/family/colleague/friend?) Fear of being overwhelmed. Fear of opening up a box of worms, losing control, etc. I can relate to all of it, but most certainly, the overwhelm. In my twenties, when I first embarked on my own inner journey, I was confronted with a wall I had built up around my emotions. As the article above suggests, it took someone else to point it out to me. Thank goodness they believed in me enough, had the courage and skill to do it with compassion. I certainly wasn’t going to see it myself. In retrospect, I can see why my self preservation instinct (i.e. ego) kept me blind. Once there was a crack in the wall, the floodgates opened, and yes, it was a little overwhelming at first. However, what lay beyond was well worth it. If you’ve read this far, maybe you can relate. Maybe you’re looking for a way in. Previously I’ve talked about exploring your values and clarifying a purpose, but that can be elusive without a sense of who you are. As a simple starting point, I often suggest the ubiquitous assessment tools, a.k.a. personality models. (Okay, cue the eye rolling.) This could mean anything from the zodiac to Myers Briggs. I agree that, in the wrong hands, they can be used to manipulate. Proponents can use them as crutches to easily label and avoid seeing complexity. All this, however, does not erase how eye-opening they can be for someone to learn more about themselves. One of the most prevalent personality tools in my industry has been the “colors” or “gems” model. I have found it to be a very simple, easy to use model and knowing where I fit into it has certainly helped me communicate better. However, when I wanted to go deeper, I found its simplicity to be limiting. Then, my good friend Toni introduced me to the Enneagram. At the risk of sounding bombastic, one of the most transformative life experiences I’ve had thus far was at a week long Enneagram workshop at the Omega Institute, studying with Russ Hudson and Jessica Dibb. What I learned there has influenced me ever since. 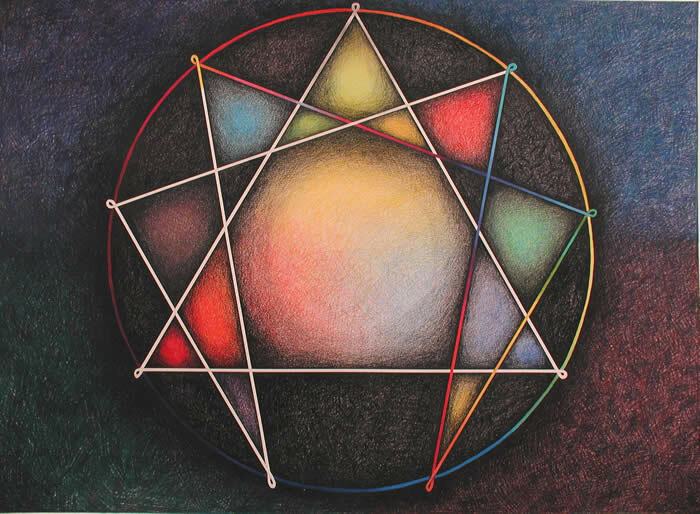 Whether you use the Enneagram, or any of these modalities, doesn’t matter. There are many paths to learning more about ourselves. Choosing to continue on the path is what matters. Yes, we might be afraid of being overwhelmed, but what if that leads to profound inner peace? What if losing control actually leads to gaining it? What if, by digging into that box of worms, we find the beautiful flower of our inner strengths? What if the only way to have success in leadership is in leading ourselves first? Personal growth is as important to our total health as nutrition and exercise. When we ignore self exploration, we are making the choice to limit ourselves just as certainly as ignoring our health does. Without the willingness to honestly look in the mirror and grow ourselves, we will be forever limited by what we are hiding from, whether we are aware of what lays hidden or not. It’s just that simple. And, it is our choice.